Samuel Miller founded Trumbull Industries in 1922, as the Trumbull Plumbing Supply Company. Trumbull (named after Trumbull County) was first established in Warren, Ohio as a wholesale plumbing distributor. In 1957, the Youngstown, Ohio branch was moved to a larger location and designated as the company Headquarters. 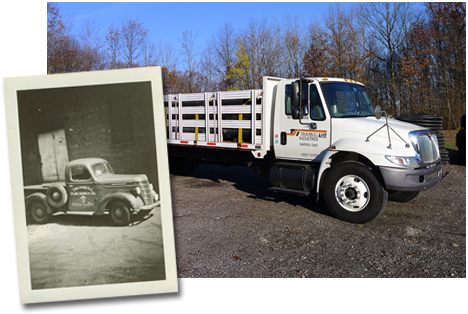 In 1962, Trumbull expanded into Meadville, Pennsylvania with the acquisition of Moody Pump and Supply. Moody Pump was a distributor for residential water systems and municipal products. This began the Municipal Division for Trumbull, operating in Western Pennsylvania and Northeastern Ohio. In 1972, Trumbull opened a branch in Akron, Ohio. In the same year, our name was changed to Trumbull Supply, reflecting our diversity beyond plumbing supplies, now including Municipal, Industrial and Kitchen products. In 1980, the Erie, Pennsylvania branch was established through an acquisition. In 1981, Trumbull began its Municipal Manufacturing Division, with its own brand of “manufactured waterworks specialty products”. In 1984, Trumbull, began its treatment plant division, becoming one of the first distributors in the country to specialize in providing ductile pipe, valves and related materials for water and wastewater treatment plant projects. In 1986, Trumbull's Municipal Division opened a yard in the Pittsburgh market, in conjunction with the closing of the yard of a major supplier of ductile pipe, valves and hydrants. This branch in Bentleyville, Pennsylvania services water and sewer contractors and municipalities in the Pittsburgh, Pennsylvania area along with parts of Maryland and West Virginia. In 1988, Trumbull began contract service work, which includes valve insertion, linestopping and hot-tapping of water mains. In 1991, the assets of the Ludlow-Rensselaer Hydrant Company were acquired, including its machine shop. Manufacturing equipment would be relocated into a facility in Warren, Ohio. In 1994, Trumbull Manufacturing, Inc. was incorporated as the manufacturing company for municipal products. As the company's activities continued to broaden, our name was changed again, from Trumbull Supply to Trumbull Industries. Trumbull now distributes waterworks products in Youngstown and Akron, Ohio, as well as Meadville and Bentleyville, Pennsylvania, These 4 branches are staffed by experienced sales personnel, representing leading manufacturers in the waterworks industry. With our established locations in place, Trumbull concentrated on improving its core business. Our treatment plant division is staffed with experienced inside and outside sales personnel. Our piping technicians are known for accurate takeoffs and reliable pipe layout drawings. Our Tapping Services division has made significant investments in equipment, now making hot taps through 20”, as well as valve insertions and linestops through 12”. Our Manufacturing Division has made ongoing investments in engineering, R & D and tooling. Every year, Trumbull improves and expands its product line, which is now marketed throughout the USA and internationally. Today, Trumbull Industries’ Municipal Division is a unique blend of distribution, manufacturing and service work, dedicated to delivering quality, customer service and value.